2017 Southeastern Naturalist Notes Vol. 16, No. X N40 A.M. Moser, C.A. Diggins, and W.M. 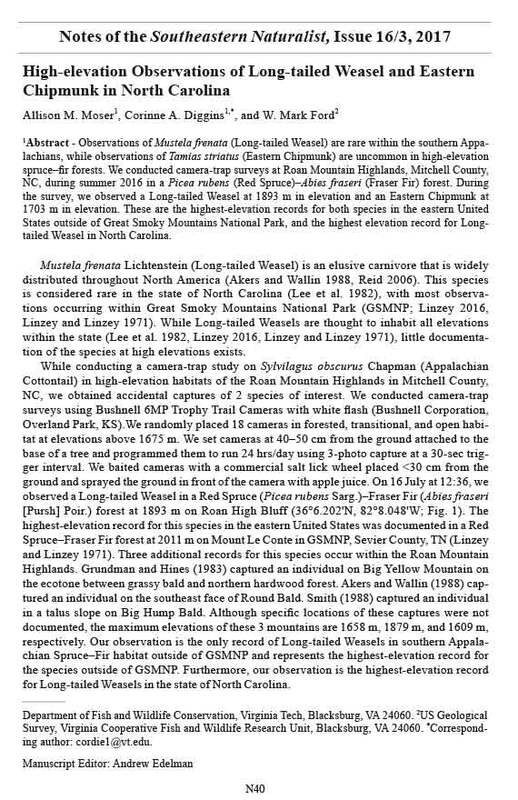 Ford High-elevation Observations of Long-tailed Weasel and Eastern Chipmunk in North Carolina Allison M. Moser1, Corinne A. Diggins1,*, and W. Mark Ford2 1Abstract - Observations of Mustela frenata (Long-tailed Weasel) are rare within the southern Appalachians, while observations of Tamias striatus (Eastern Chipmunk) are uncommon in high-elevation spruce–fir forests. We conducted camera-trap surveys at Roan Mountain Highlands, Mitchell County, NC, during summer 2016 in a Picea rubens (Red Spruce)–Abies fraseri (Fraser Fir) forest. During the survey, we observed a Long-tailed Weasel at 1893 m in elevation and an Eastern Chipmunk at 1703 m in elevation. These are the highest-elevation records for both species in the eastern United States outside of Great Smoky Mountains National Park, and the highest elevation record for Longtailed Weasel in North Carolina. Mustela frenata Lichtenstein (Long-tailed Weasel) is an elusive carnivore that is widely distributed throughout North America (Akers and Wallin 1988, Reid 2006). This species is considered rare in the state of North Carolina (Lee et al. 1982), with most observations occurring within Great Smoky Mountains National Park (GSMNP; Linzey 2016, Linzey and Linzey 1971). While Long-tailed Weasels are thought to inhabit all elevations within the state (Lee et al. 1982, Linzey 2016, Linzey and Linzey 1971), little documentation of the species at high elevations exists. While conducting a camera-trap study on Sylvilagus obscurus Chapman (Appalachian Cottontail) in high-elevation habitats of the Roan Mountain Highlands in Mitchell County, NC, we obtained accidental captures of 2 species of interest. We conducted camera-trap surveys using Bushnell 6MP Trophy Trail Cameras with white flash (Bushnell Corporation, Overland Park, KS).We randomly placed 18 cameras in forested, transitional, and open habitat at elevations above 1675 m. We set cameras at 40–50 cm from the ground attached to the base of a tree and programmed them to run 24 hrs/day using 3-photo capture at a 30-sec trigger interval. We baited cameras with a commercial salt lick wheel placed less than 30 cm from the ground and sprayed the ground in front of the camera with apple juice. On 16 July at 12:36, we observed a Long-tailed Weasel in a Red Spruce (Picea rubens Sarg. )–Fraser Fir (Abies fraseri [Pursh] Poir.) forest at 1893 m on Roan High Bluff (36°6.202'N, 82°8.048'W; Fig. 1). The highest-elevation record for this species in the eastern United States was documented in a Red Spruce–Fraser Fir forest at 2011 m on Mount Le Conte in GSMNP, Sevier County, TN (Linzey and Linzey 1971). Three additional records for this species occur within the Roan Mountain Highlands. Grundman and Hines (1983) captured an individual on Big Yellow Mountain on the ecotone between grassy bald and northern hardwood forest. Akers and Wallin (1988) captured an individual on the southeast face of Round Bald. Smith (1988) captured an individual in a talus slope on Big Hump Bald. Although specific locations of these captures were not documented, the maximum elevations of these 3 mountains are 1658 m, 1879 m, and 1609 m, respectively. Our observation is the only record of Long-tailed Weasels in southern Appalachian Spruce–Fir habitat outside of GSMNP and represents the highest-elevation record for the species outside of GSMNP. Furthermore, our observation is the highest-elevation record for Long-tailed Weasels in the state of North Carolina. Department of Fish and Wildlife Conservation, Virginia Tech, Blacksburg, VA 24060. 2US Geological Survey, Virginia Cooperative Fish and Wildlife Research Unit, Blacksburg, VA 24060. *Corresponding author: cordie1@vt.edu. Manuscript Editor: Andrew Edelman Notes of the Southeastern Naturalist, Issue 16/3, 2017 N41 2017 Southeastern Naturalist Notes Vol. 16, No. X A.M. Moser, C.A. Diggins, and W.M. Ford Tamias striatus L. (Eastern Chipmunk) is a common semi-arboreal squirrel that is widely distributed throughout eastern North America (Lee et al. 1982, Reid 2006). It is found in a diverse array of habitats, but is generally more common in hardwood forests (Linzey 2016, Linzey and Linzey 1971). During the same camera-trap survey in the Roan Mountain Highlands, we observed an Eastern Chipmunk in Red Spruce–Fraser Fir forest at Carver’s Gap at 1703 m on 10 July at 12:43 (36°6.310'N, 82°6.676'W; Fig. 2). The highest Figure 1. Mustela frenata (Long-tailed Weasel) in a Red Spruce–Fraser Fir forest on Roan High Bluff, Roan Mountain Highlands, Mitchell County, NC, at an elevation of 1893 m. Figure 2. Tamias striatus (Eastern Chipmunk) in a Red Spruce–Fraser Fir forest at Carver’s Gap, Roan Mountain Highlands, Mitchell County, NC, at an elevation of 1703 m. 2017 Southeastern Naturalist Notes Vol. 16, No. X N42 A.M. Moser, C.A. Diggins, and W.M. Ford confirmed record for Eastern Chipmunk is on Clingman’s Dome at 1983 m in Swain County, NC (Linzey 2016). Additionally, there is an anecdotal account of an Eastern Chipmunk atop the summit of Mount Le Conte at an elevation of 2009 m (Linzey and Linzey 1971). Within the Roan Mountain Highlands, Eastern Chipmunks were found on Big Yellow Mountain, Round Bald, and Big Hump Bald (Akers and Wallin 1988, Grundman and Hines 1983, Smith 1988). Our observation is the only record of an Eastern Chipmunk using Spruce–Fir forests in the Roan Mountain Highlands and the highest documented elevation for Eastern Chipmunks in the southern Appalachians outside GSMNP. Camera trapping can be particularly valuable for assessing the distribution of multiple species across a landscape (Rich et al. 2016, Welbourne et al. 2015). Wildlife managers may find camera trapping useful as a tool to understand species distribution across the landscape, especially for rare species (i.e., Long-tailed Weasels) or rare habitat associations of common species (i.e., Eastern Chipmunk) . Understanding species distributions is important for effective wildlife management (Graeter et al. 2015), especially due to a changing landscape and climate. Acknowledgments. We would like to thank the Atlantic Coast Conference Creativity and Innovation Fellowship and the Honors College at Virginia Tech for funding this project. Thanks to Marquette Crockette and the Southern Appalachian Highlands Conservancy for providing housing. Thanks to Sara Cheatham and Eli Podyma for providing field assistance. We thank Andrew Edelman and 2 anonymous reviewers for comments that improved this manuscript. This work was conducted under Virginia Tech IACUC permit #16-049. The use of any trade, product, or firm names does not imply endorsement by the US government. Literature Cited Akers, S.M., and J.E. Wallin. 1988. Mammals of the Roan Mountain Bald Complex. Report submitted to the Southern Appalachian Highlands Conservancy, Asheville, NC, and US Forest Service. 29 pp. Graeter, G.J., C.A. Diggins, K.C. Weeks, and M.K. Clark. 2015. New distribution records for bats in northwestern North Carolina. Southeastern Naturalist 14(1):98–1 05. Grundman, W.J., and S.P. Hines. 1983. A survey of the vertebrate fauna of Big Yellow Mountain, North Carolina. Report submitted to The Southern Appalachian Highlands Conservancy, Asheville, NC, and The North Carolina Nature Conservancy, Durham, NC. 81 pp. Lee, D.S., J.B. Funderburg Jr., and M.K. Clark. 1982. A distributional survey of North Carolina mammals. Occasional Papers of the North Carolina Biological Survey 1982(10):1–70 Linzey, A.V., and D.W. Linzey. 1971. Mammals of Great Smoky Mountains National Park. The University of Tennessee Press, Knoxville, TN. 144 pp. Linzey, D.W. 2016. Mammals of Great Smoky Mountains National Park: 2016 revision. Southeastern Naturalist 15(Monograph 8):1–93. Reid, F.A. 2006. Mammals of North America. Houghton Mifflin Company, New York, NY. 579 pp. Rich, L.N., D.A. W. Miller, H.S. Robinson, J.W. McNutt, and M.J. Kelly. 2016. Using camera trapping and hierarchical occupancy modelling to evaluate the spatial ecology of an African mammal community. Journal of Applied Ecology 53:2336–1235. Smith, A.B. 1988. A survey of the mammals of Big Hump, Little Hump, and Grassy Ridge Balds. Report submitted to The Southern Appalachian Highlands Conservancy, Asheville, NC. 16 pp. Welbourne, D.J., C. MacGregor, D. Paull, and D.B. Lindenmayer. 2015. The effectiveness and cost of camera traps for surveying small reptiles and critical weight range mammals: A comparison with labour-intensive complementary methods. Wildlife Research 42:414–425.